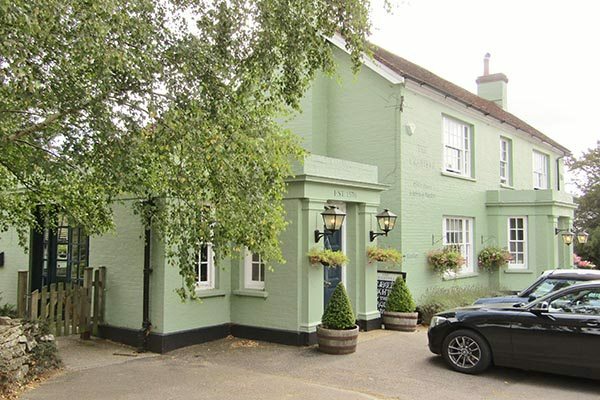 It’s a sunny Sunday morning and what better way to enjoy the remainder of the weekend than a drive to the country for a relaxing meal in a beautiful village pub. This Sunday’s venue is The Crabtree, just south of Horsham and a half an hour drive from Brighton. 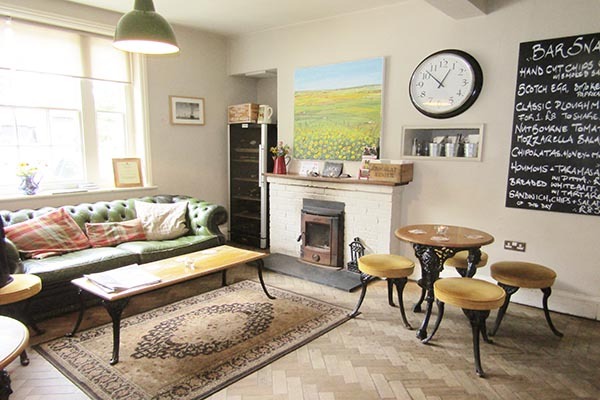 Surrounded by the beautiful countryside of Sussex, The Crabtree is a stunning historic pub with original features and a wonderful setting; you must ask for a tour. The gardens are amazing and, when it is a little warmer, it is perfect for some alfresco dining. I can understand why this is a popular wedding venue as it just blows you away! We are greeted warmly by Steve and the rest of the staff. After being shown around the pub, we are shown to the dog friendly dining room. 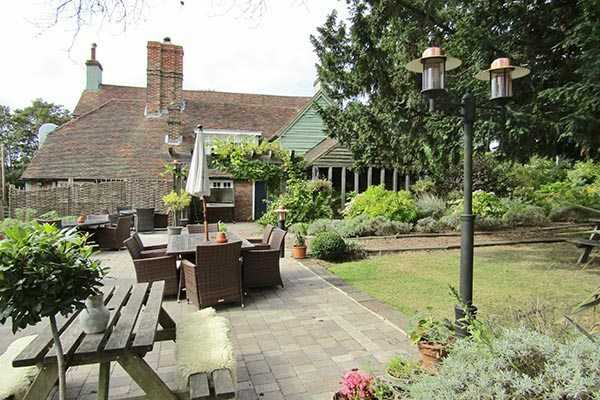 The Crabtree has many areas but this is not only a great spot for dog lovers but has great views of their gardens which are maintained perfectly. As Lucy is driving she orders a soft drink and I go straight for a hoppy ale; they have a great choice of drinks and cater to everyone’s taste. As we run through the menu we ask for the Chef’s recommendations. Normally I would order a meat starter and the game terrine with pickled rhubarb and toast is right up my street. The Chef, however, recommends the beetroot, grapefruit, hazelnut and goats cheese salad and the chargrilled asparagus with poached egg and hollandaise sauce. Keen to try something a little different, we take the recommendations. As we enjoy the sun beaming through the restaurant, the starters are brought to the table. 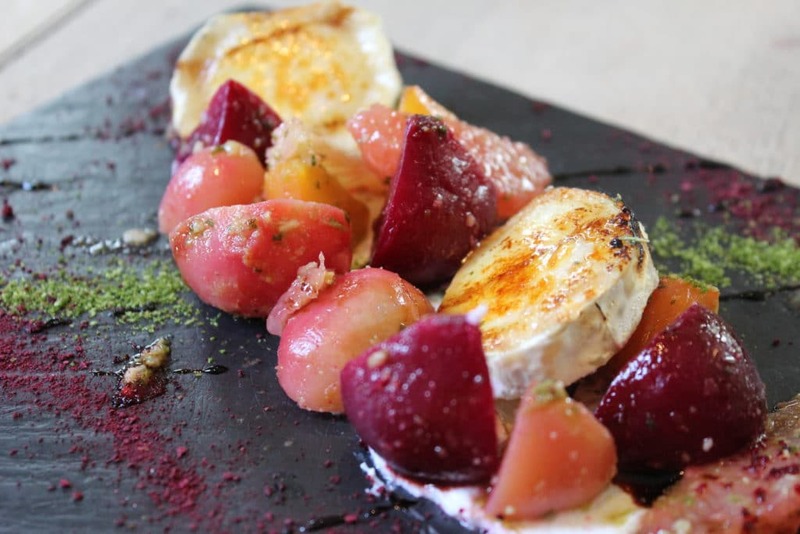 The beetroot dish is served on black slate which shows off the vibrant colours of the variety of beetroot. Bright pinks, reds and yellows adorn the plate, with segments of grapefruit placed neatly between the beetroot and chunks of goat cheese. This is a refreshing dish and the grapefruit cuts through the goats cheese and compliments it perfectly. A truly delicious starter, perfect before a larger main course; a great recommendation! A top chef, and you can tell! The chargrilled asparagus looks tasty and fresh, the spears of asparagus are huge and tender. 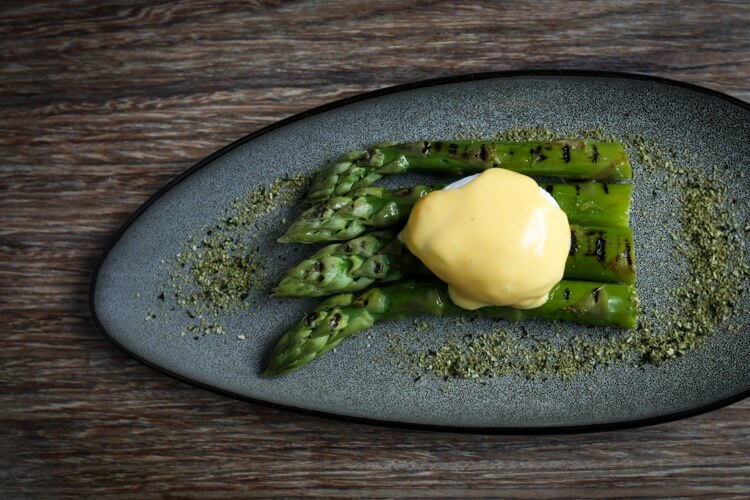 The rich egg and hollandaise sauce is a real indulgence against the earthy taste of the asparagus. Everything is seasoned exactly as you expect from a top chef and as a simple starter, this is a winner. This is why you should ask for recommendations and try something you may not normally order, what a treat! It is a Sunday and having heard how great their beef roast is we have to order this. We also want to sample a dish away from the Sunday offering so again, on the recommendation of the Chef, we order the pan fried salmon. 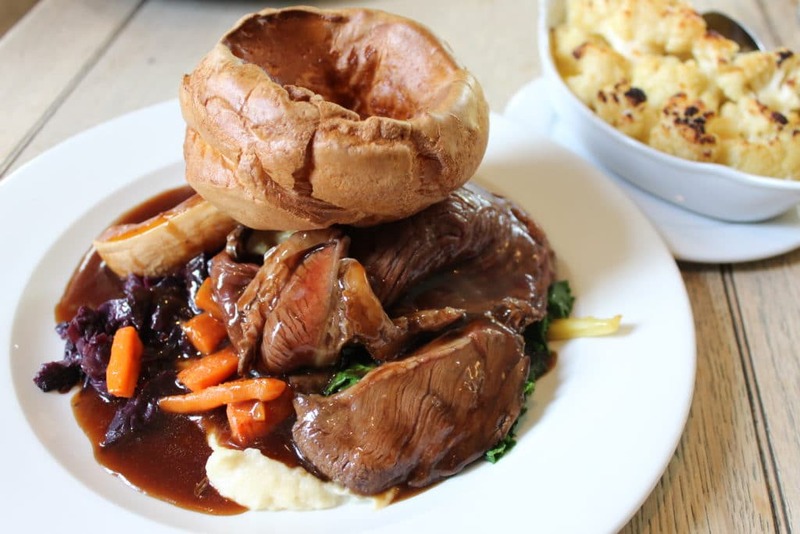 The roast beef is 28 day aged rump served with all of the trimmings, from carrots to red cabbage, kale and butternut squash with the most amazing eye popping Yorkshire pudding resting on top. This is a roast of champions, the beef just melts in the mouth and is nice and pink. The roast potatoes are crisp on the outside and fluffy in the centre, the vegetables have a slight bite and are seasoned to perfection. The Yorkshire has a nice crunch on the edges yet soft in the middle; add the rich sumptuous gravy and every mouthful is a taste sensation. The pan fried salmon is served with a nicoise salad, tomato and a hen egg. 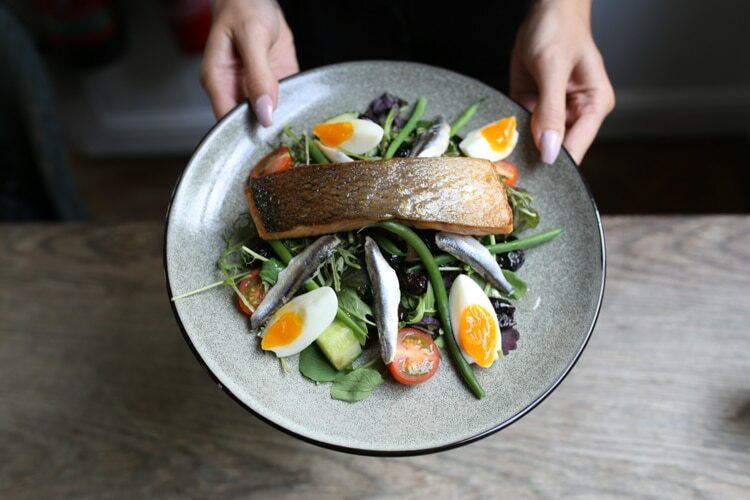 Again, the use of dark plate just brings the dish to life, the egg cut in to segments adds the bright colour of the rich yolk, the anchovies glisten between the green beans and salad leaves. The use of a variety of tomatoes not only adds more colour to the plate but a real freshness that shows the great local produce The Crabtree use. The salmon itself is delightful and just falls apart easily. I love this dish and the slight crunch of the beans give an extra texture to the dish. My advice is have a little bit of everything on your fork and dip this in the most amazing pesto and this really is food heaven, again another great chef suggestion. Though very full and satisfied, there is no way we can leave without trying a couple of desserts as everything else has been superb! 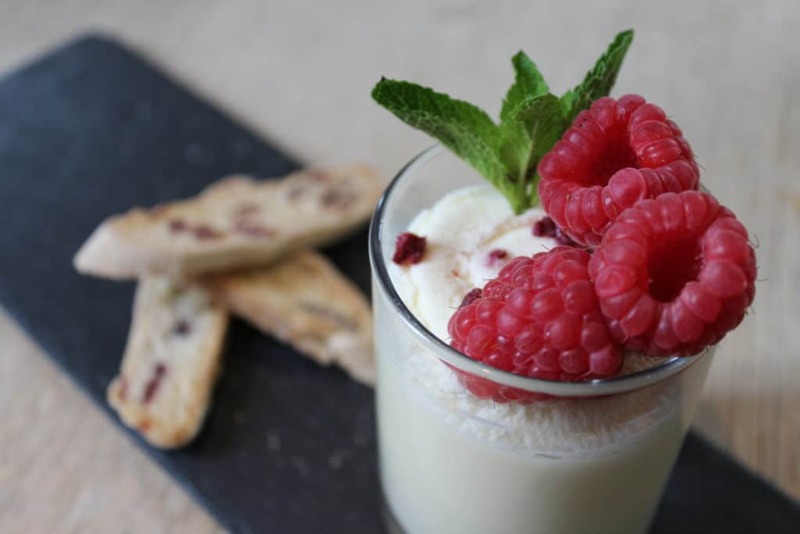 I order one of my favourites the lemon posset but with a slight difference, this is a lemon and lime posset served with fresh raspberries and cranberry biscotti. The posset unsurprisingly is fantastic, creamy with great citrus flavour matched with the juicy, tart raspberries. Scooping this delightful dessert with the crunchy biscotti is extremely moreish and finishes one the best meals I have had in ages in style. Lucy chose to try the frangipane and griottine cherry tart, served with vanilla ice cream and a kirsch syrup, which looks just as impressive as my posset. 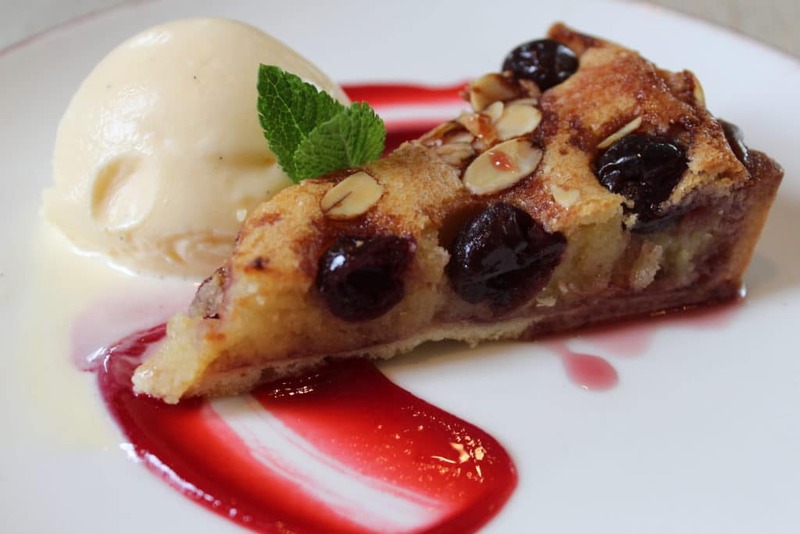 The tart is moist and the casing has a bite, the cherries compliment the marzipan flavour and the syrup and ice cream rounds off a mouth watering three courses of top quality cooking and service. 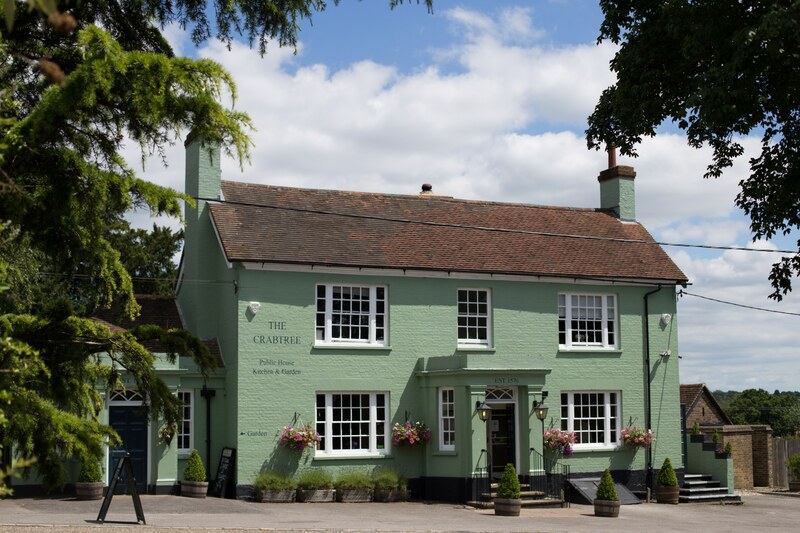 The Crabtree is a fantastic village pub that is worth the drive, the staff are attentive and knowledgeable and you are made to feel instantly at home. The chef and the food is out of this world and the setting and views at The Crabtree match the service. I will be back especially to sit in the garden come summer and enjoy the alfresco dining.